Home>Education>Personal Finance>What is a Trust Account? A trust bank account can be opened at almost any bank. The point of a trust bank account is that it allows an individual to give assets to another individual (child, grandchild, sibling) or organization (non-profit) while also allowing the individual giving the assets to retain some control of how the assets in the trust bank account are managed and dispersed. The individual or organization receiving the assets is called the beneficiary. A trust bank account, which is sometimes referred to as a Totten trust, after a famous legal case, can allow you to pass some of your assets on to your heirs without the requirement of clearing probate. Trustee: Person (or persons) that control the assets in the account. This person is legally responsible for making decisions about the assets in the account. Beneficiary: Person (or persons) or organization that receive the assets at some date. This can be upon the passing of the trustee, after a certain time has gone by, or when a minor reaches the age of majority. Custodian: The entity in charge of holding the account. In the case of many Totten trusts, this is the bank. 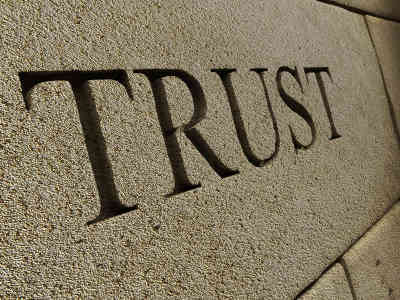 The point of the trust is for someone to provide for another individual, or a group. There can be more than one trustee, and a trustee can designate “successor trustees” to take over in the event that the person forming the trust passes on. A trust account is opened fairly easily. You can open one at almost any bank. You just need to set up the bank account with a name and trustee designation. Additionally, you need to name a beneficiary. This is whom the assets are being managed on behalf of. Find out what documentation you need before you go to the bank to open a trust account. What Can Be Held in a Trust Account? A bank trust account can hold a number of assets. It is possible to hold cash in a trust bank account, of course. But other assets that can be included in a trust account are bonds, stocks, funds, and even real estate. In addition to Totten trust accounts, there are designations like “living trust” and “irrevocable life insurance trust.” It’s important to understand your options, and do research before opening any kind of trust account. Many families with a significant number of assets choose to set up trust accounts in a way that allows beneficiaries and others to make use of the assets while getting around some tax issues and avoiding probate. However, it’s important to consult with a knowledgeable estate planning attorney before making your decision. A knowledgeable financial planner or estate planner can help you set up your trust in a way that makes sense for you. You can open a trust at almost any bank. There are major trust banks, as well, like State Street Corp and Northern Trust Corp, that can help you set up your trust accounts. An important thing to be aware of when choosing a bank to open a trust account (trust bank accounts are covered by FDIC insurance) with is whether or not the bank has FDIC insurance.